There’s a lot to be said for individuality and photographic style. Some of the most well known photographers are, in fact, recognized by a particular subject matter and photographic composition before anyone reads their by-line. This begs the question from novice photographers, do I start developing my own personal style right away? Well, kind of. Testing one’s own creative abilities should always be encouraged but gaining a working knowledge of some basic principles is important for a foundation on which to express one’s style more effectively. What I hope to get across in this paper is not so much a lesson in photo mechanics, nor an attempt to define the litany of new terms arising from the advent of digital image creation. Instead, the message is simply to suggest and emphasize ways to “frame” the world around you in ways to capture it in a more appealing way……to yourself and others. Better to be armed with the fundamentals rather than jump right into the unknown; I think you’ll find out that most accomplished photographers endorse a mastery of the basics prior to becoming that “individual” to which we all aspire. Most, if not all of the strategies employed to create better photos rely heavily on some sense and attention to photographic composition, and these strategies come straight from the art world….visiting that age-old argument of photography as art, but we won’t go there right now! The following, related discussion is not exhaustive, but will get you off on the right foot towards seeing and shooting better images, as well as working towards a style of your own that everyone may soon come to know you by. Consider these compositional tips and try to “practice” them in your future work. Talk about an easy rule, why, this one defines itself. Think of it as positioning elements within your photo in imaginary sections of thirds within the entire image; quite often, horizon lines and architectural features, tree trunks and masses of flowers define the lines that make these “thirds.” I like to simplify the definition and teach students to simply avoid “cutting” the image in half or steer clear of centering objects in the photo. This rule can certainly be broken to result in a terrific photo, and often has, but I believe that experience alone will lead to a successful outcome in this regard and one should practice the rule before straying from its proven outcome. "The field of tulips neatly occupies two thirds of the vertical image, leaving the remaining one third to the turf and trees at the top." This rule relies on both what you can see “for real” and what you believe your eyes are seeing through the arrangement of objects in your field of view. Diagonals can be real or perceived within an image; imagine a wall, the border of a garden, or the strategic positioning of cascading branches, all can intentionally cut across the field of view. However, when each is positioned (i.e. composed) so as to divide the frame in sections without being parallel to either side (i.e. diagonally); they lead to an appealing and perceived sense of motion in the image. Whether you actually sense this strongly or not, your eyes generally start at one end of the diagonal and run to the other. It is a pleasing and often appealing effect, and one that is easily established in an image with practice and simple training of the eye. This may be the easiest of all to implement…..do you like dogwood flowers, seashells on the beach, or a field of pumpkins? Well, then fill the entire frame with what you love and literally overload your visual senses with anything that creates an impact en masse. 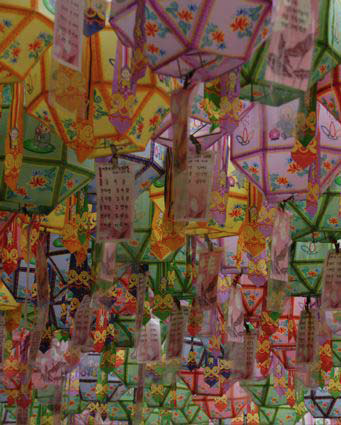 Paper lanterns effectively fill the frame with color, shapes, and textures. Where diagonals can make you feel like your photo has motion, layering can create the illusion of depth in your two dimensional image. The strategy here is to alternate and oppose against one another contrasting colors, different textures, or unmatched shapes. This compositional style has your eyes moving from “front to back” to discern whatever falls in the foreground and back to the rear of the photo. Lupines and rhododendron flowers layered against one another. And just think, in a short time you’ll actually be combining these compositional approaches and becoming instinctive about using them. I think you’ll find that your images will gain more attention, compliments, and overall interest from those who see them. So, now you want to sell them? Well, I suspect you’ll be more successful having implemented these basic principles, but how do you exactly make the sale? That’s for another story, another day! In the meantime, just keep shooting and start to develop a thick skin! Reprinted from Lotus Leaflets, Fall 2006.